Both Jeff and I really like the composite version of Valley Sea Kayak's Gemini SP and were really looking forward to trying out the plastic version. (Here's a link to my review of the composite Gemini). At Lumpy Waters, Jeff got to paddle the plastic version of the Valley Gemini SP He liked the boat so much that he bought it, and it journeyed home with us to the Mendocino Coast. Over the past 2 months, I have had her out on sea kayak rock garden play days, coastal exploration tours, kayak crabbing, and BCU 3* Training Sessions. Here are my thoughts and recommendations. (I am 5'4", 120 pounds and a skilled paddler who likes a responsive boat). Lightweight: The plastic Gemini is light for a plastic boat. Having hefted around many a plastic sea kayak, I was instantly impressed with the weight of the Gemini. I guess I was expecting a beast like many of the newer plastic sea kayak play boats but was pleasantly pleased. Valley Gemini SP at home among the rock gardens and sea caves of the Mendocino Coast. Comfortable: The Gemini is comfortable and easily adjustable. I am pleased that I am not on the shortest setting for the foot braces but have 2 more clicks. The cockpit and deck height seem a little bit snugger/lower than the composite version. Here is a link to a blog post by Dave Dalby at Alder Creek Canoe and Kayak about outfitting adjustments to make it fit better. The cockpit is a little bit long to my liking and I find getting my snug fitting spray decks on a bit cumbersome. For teaching, I have switched to using a larger spray deck that is easier to put on. When heading out to play in the surf or rock gardens, expect to see my contortion act of getting a snug spraydeck on (or perhaps give me a hand). The hatches are well configured. YEAH - it has a day hatch!!! I found the day hatch to be accessible while on the water. Stability: Right off the bat, I noticed the primary stability of the Gemini. Students who have paddled the boat have noticed the same thing - "Its not as tippy" (compared to our Avocets). After paddling the soft chined poly Valley Avocet for years, I am still getting used to the hard chines of the Gemini. The Gemini definitely responds to skilled paddling and loves to be edged for turns. On the Water: The Gemini is a comfortable, stable craft that feels nimble in dynamic waters. The bow volume, stability, and looseness of the stern make her quite playful in bouncy waters and really fun for rock gardening. She feels like she was designed for rock gardening. The Gemini handles like a play boat but paddles like a sea kayak. (Many of the newer play sea kayaks don't require an edge to turn efficiently and actually can be a bit difficult for us smaller paddlers to edge to turn). I enjoy the nuance of edging a sea kayak to carve turns. The Gemini responds well to edging and handles well when paddling backwards. The poly Gemini isn't a speedy boat. I was surprised by the speed of the composite Gemini and a little disappointed that the plastic version isn't a little bit faster. Although, she isn't any slower than the other plastic sea kayaks made for play (P&H Delphin, P&H Hammer, and Dagger Alchemy). Edging and speed aren't the top priority when kayak crabbing. A flat deck that one can attach crab pots to and a day hatch for transporting dinner are nice features on the Gemini for those of us who use a sea kayak to get dinner. Conclusions and Recommendations: I definitely think that Valley has a winner in the playful sea kayak category with the Gemini SP. For those looking for a durable plastic kayak for rock garden play, I would highly recommend the Valley Gemini SP. I especially think that it is a good option for smaller paddlers who want a lightweight yet capable plastic boat. The poly Valley Gemini SP has become my go-to sea kayak for rock gardening. I foresee the Valley Gemini SP joining our fleet as an instructional boat. I like the primary stability for inspiring confidence in beginners yet it is a boat that responds to dynamic and skilled paddling. It will be a good "school boat" for teaching sea kayak skills like edge control, carving turns, and paddling backwards as well as a great boat for rock gardening classes. 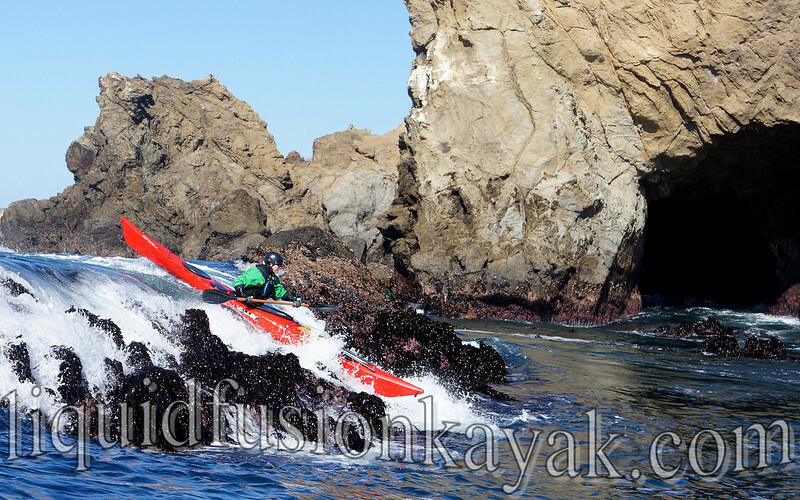 If you are looking for an opportunity to demo Valley Sea Kayak's Gemini SP, they will be available at the Golden Gate Sea Kayak Symposium. 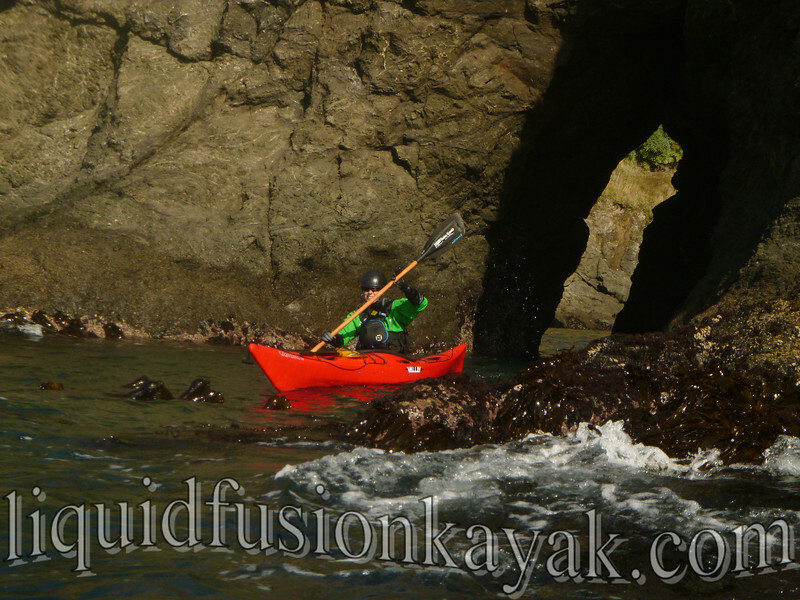 We will also have a couple in the Liquid Fusion Kayaking fleet for our rock garden and sea kayak classes. If you have any experiences or questions about the Valley Gemini SP, please post them in the comments below or contact me through Liquid Fusion Kayaking. I anticipate adding more to this review when we have more experience paddling and having students paddle the Gemini.